MEDIUM 14.4 x 20.9 in. (336 x 530 mm) 18.5 x 24 in. LARGE 20.9 x 28.7 in. (530 x 727 mm) 24 x 34 in. This unique composition is an accurate copy of an early twentieth century thangka from the Potala Palace in Lhasa, which shows the Medicine Buddha seated upon his magnificent enlightenment throne with the lineage of Buddhas and Teachers of the Tibetan Medical Tradition above, and the special protectors of this Tradition below. The Medicine Buddha, or ‘Medicine Guru’ (Skt. Bhaishajyaguru), is also known as Vaidurya-prabha-raja, the 'King of Vaidurya Light', in respect to the bright blue light rays that emanate from his body. These rays dispel the darkness of ignorance, desire, and aversion, which are the causes of imbalances in the three corresponding humors (Skt. doshas) of phlegm, bile, and wind. Bhaisajyaguru is also recognized as the aspect that Shakyamuni Buddha assumed in order to reveal the medical tantras, and his meditation practices are performed to cure physical diseases, alleviate mental and emotional disorders, and eliminate the obstacles to health, happiness, longevity and harmony. The Medicine Buddha's Pure Land is known as Shudarshana, meaning 'Beautiful to Behold', which is also identified with Indra's paradise, the heaven of the 'Thirty-Three' (Skt. trayastrimsha), which is located at the summit of Mt Meru. The Medicine Buddha (Tib. Sangye Menla) is deep blue in colour and he sits in vajra-posture upon a white moon disc and a multicoloured lotus above an ornate lion-throne. He is adorned with the thirty-two major and eighty minor marks of an enlightened Buddha, his palms and soles are adorned with eight-spoke golden wheels, and he wears the three embroidered red robes of a Buddhist monk. With his lowered right hand as he makes the varada-mudra of supreme generosity as he holds the triple-fruited stem of a medicinal myrobalan plant (Terminalia Chebula). With his left hand resting upon his lap in the dhyana-mudra of meditation he holds an alms-bowl made from dark blue beryl (Skt. vaidurya) gemstone that contains the white nectar of immortal wisdom, and three golden myrobalan fruits that are shaped like Mount Meru. The plum-like myrobalan fruit (Skt. haritaki; Tib. arura) is widely used in Tibetan and Ayurvedic medicine as a panacea for many different kinds of illnesses. Bhaishajyaguru’s lion-throne is eight-sided and fashioned from all manner of precious materials, such as blue beryl, sapphire, red coral, gold and silver, with the heads of two roaring bluish-white lions appearing behind the orange brocade cloth that falls from the centre of his throne. This cloth is finely decorated with dragon motifs, and in front of it is a blue-topped altar table with a pleated silk front and an upper frieze of small green and blue silk valances. On the top of this table are two flower-filled golden vases and a golden tray full of flowers, fruit and seed heads, with a golden eight-spoke wheel or dharmachakra at its centre. Behind Bhaishajyaguru’s radiant aura and halo appears the arched torana or back-support (Tib. rgyab-rten) of his ‘Six Ornament Enlightenment Throne’ (Tib. rgyan-drug rgyab yol)). This takes the form of two symmetrical white elephants that stand at its base wearing silk saddle blankets and crowning jewels. On the back of each elephant stands a fierce blue lion, and above each lion stands a green sharabha – a mythical deer-like creature with a lion’s mane and the horns and scales of a dragon. And above each sharabha is a young deva or god that supports a jeweled crest-bar with both hands. This curved crest-bar is fashioned from blue beryl or sapphire and gold, with a length of red and green silk brocade draped over it as a cover. Standing upon each jeweled end of the crest-bar is a fierce water-monster or crocodile (Skt. makara), with a scaled grey body, a red mane, two paws, an upraised snout, and a fish-like tail - from which emerges the feather-like scrolling profusion of his long colourful tail. Above are two naga-serpents with human upper bodies and long green serpentine tails, which are adorned with silk garments, golden ornaments, jeweled crowns, and bow with their palms folded in supplication. The powerful form of Garuda crowns the torana, with a pinkish-brown human upper body, a grey-feathered lower body, and outspread blue wings. With his two outstretched hands he grasps a long naga-serpent that he bites down upon with his sharp iron-like beak. Garuda wears gold ornaments and his hawk-like face has two piercing eyes, two sharp horns, and his tawny-orange mass of hair is crowned with an eight-faceted wish-granting gem in an ornate golden mount. A profusion of leaves, flowers, buds, and billowing blue clouds surrounds the six-fold ornaments (elephants, lions, sharabhas and devas, makaras, nagas and garuda) of the Medicine Buddha’s elaborate enlightenment throne. Seated upon a silk cushion and a lotus amidst the clouds and flowers at the top centre of this composition is the 'Great Fifth' Dalai Lama, Ngawang Lobsang Gyatso (1617-1682), who holds Avalokiteshvara’s emblem of a lotus in his right hand, and three golden myrobalan fruits in his left hand. Seated upon the moon disc and lotus to the Great Fifth’s left is Padmakara (Padmasambhava), who bears the three attributes of a vajra, a skull-cup, and a khatvanga. And seated upon the moon disc and lotus to the Great Fifth’s right is Shrimala, or Yeshe Khandroma Tsomo Palden Phren (Ye-she mkha-grohi gtso-mo dpal-ldan-‘phreng)). As the foremost of all wisdom or Jnana Dakinis, Shrimala is white in colour, slightly wrathful with three eyes, and she wears a blue silk ‘cloud-collar’, a tiger-skin loincloth, and holds a skull-cup full of blood in her left hand. Amidst clouds in the upper left and right corners are the forms of five Buddhas or ‘Hermit Sages’ who are coloured like the ‘Five Buddhas’ to represent the enlightened aspects of body, speech, mind, attributes or qualities, and activities. In the top left corner is the yellow Hermit Sage Vidyajnana as Guna-nirmita (Tib. yon-sprul drang-srong rig ye-shes), the emanation of Buddha-attributes, whose symbol is a jewel. To his right is the blue Hermit Sage Vidyajnana as Citta-nirmita (Tib. thugs-sprul drang-srong rig ye-shes), the emanation of Buddha-mind, whose symbol is a vajra. Below these two Buddhas if the red Hermit Sage Manasija as Vac-nirmita (Tib. zhu-byed gsung-sprul yid-las skyes), the emanation of Buddha-speech, whose symbol is a lotus. In the top right corner is the green Hermit Sage Vidyajnana as Karma-nirmita (Tib. phrin-las sprul-pa rig ye-shes), the emanation of Buddha-activities, whose symbol is a crossed-vajra (vishva-vajra). And to his right is the white Hermit Sage Vidyajnana as Kaya-nirmita (Tib. sku-sprul drang-srong brig ye-shes), the emanation of Buddha-body, whose symbol is an eight-spoke wheel or dharmachakra. Descending below the five Hermit Sages in the upper left and right corners are twenty-seven lineage holders of the ‘General Lineage of the Four Tantras of Medical Science’, fourteen of whom appear on the left side, and thirteen on the right side. Directly below the trinity of Hermit Sages in the upper left corner are the three lineage holders: King Trisong Detsen (left); Shantarakshita (centre), and Nagarjuna (right). At the left below Trisong Detsen is Yuthok Yonten Gonpo, the ‘king amongst physicians during the degenerate age’, who wears a white outer robe and holds two lotuses that bear a sword and book, and a treasure vase: and to his right is Darma Trakpei Gyeltsen, ‘who resurrects the dead’. (The next six lineage-holders that descend below I hope to identify later). And the last two lineage-holders are: the great terton or treasure-finder Terdak Lingpa, who wears a white outer robe and red Nyingma hat; and Desi Sangye Gyamtso, the regent of the Fifth Dalai Lama and ‘the one called Apti’, who oversaw the drawings of the ‘Blue Beryl’ that illustrate the content of the Four Medical Tantras. Below the two Hermit Sages in the upper right corner are: the physician Jivakumarabhrita (top centre), who wears the robes of a king; the terton or treasure-finder Trapa Ngon Wangchuk Bar (lower centre); Vairocana, ‘the great translator’ (mid right); and Zhonu Yeshe, ‘the possessor of learning’ (mid left). Below Vairocana is Sumton Chenpo Yeshezung, who holds a skull-cup (right); and to his left is Sangye Rinchen, who is ‘endowed with a superior mind’. Below at the centre is Yuthok Bumseng, ‘the master of learning’, who wears a white outer robe and holds two lotuses that bear a sword and book, and a treasure vase; and below to his right is Dondrup Rinchen Pal, ‘the master of learning’. Below to the left is Gyeltseng Pelzang, ‘the lord of loving-kindness’. The remaining four lineage-holders that descend below I later hope to identify later. All the names and titles given above I have derived from Gyurme Dorje’s translations contained in the ‘Tibetan Medical Paintings’ of the ‘Blue Beryl’, which was compiled by Desi Sangye Gyamtso. In the lower area of this composition are twelve protector deities, eight of whom are special guardians of the Tibetan Medical Tradition that form the retinue of the medical protector Zhanglon Dorje Dudul, the ‘Subduer of Demons’, who appears in the bottom right corner. At the bottom centre stands Garuda (Tib. khyung), the ‘King of Birds’, who removes all afflictions and diseases that are inflicted by poisonous naga-serpents and earth-spirits. Garuda is fierce and blue-black in colour, with a corpulent human-like upper body and two arms, the feathered lower body and talons of a bird of prey, and outstretched blue wing and tail feathers. His eagle-like face has a sharp and curving iron-like beak, two round red eyes, dilated nostrils, white facial feathers, upward-pointing ears, and two sharp black horns. The tawny-red locks of his hair stream upwards, and his head is crowned by a white crescent moon and a radiant blue gemstone that he once plundered from the naga-serpents. He wears golden bracelets and armlets, a short golden necklace, and a long coiling serpent hangs around his neck as a sacred thread. With his sharp talons he tramples underfoot a long naga-serpent, and with his two outstretched hands he makes the threatening tarjani gesture as he grasps the tails of the two naga-serpents that he devours with his sharp beak. The stylized golden flames of Garuda’s outer aura encircle his radiant red inner aura, and he stands upon a vajra-rock formation with the swirling blue waters of a naga-infested lake below. To the left of Garuda is two-armed Red Hayagriva and his Consort, in his aspect as ‘Ashvottamilila, the king of wrathful deities’, (Tib. khro-bo’i rgyal-po rta-mchog rol). Hayagriva is wrathful and red in colour, with two arms, two legs, three round red eyes, upward blazing facial hair, and a gaping mouth that reveals his sharp fangs and twisting red tongue. The tawny-red hair of his head streams upward above his five-skull crown, and above his double topknot is the fierce green head of a neighing horse and a coiling snake. His powerful body is adorned with gold ornaments, the six bone ornaments, a garland of freshly severed heads, a loosened tiger-skin loincloth, a human-skin shawl, and a flayed elephant-skin that covers his back. He stands leaning towards the right in pratyalidha posture with his two feet pressing upon four naked human corpses that represent the ‘Four Maras’, who lie upon the golden sun disc of his pink lotus pedestal. With his right hand he wields aloft a vajra-handled curved knife, and with his left hand he holds a skull-cup full of blood in front of his heart as he embraces his fierce red consort. She is similar in appearance to him, with three eyes, and she holds the same attributes of a curved knife and skull-cup in her right and left hands. She wears the five bone ornaments, a leopard-skin loincloth, a five-skull crown, and her disheveled brown hair hangs freely down her back. In the bliss of sexual union she presses herself against her lord, with her right leg extended and her left leg wrapped around his waist. They are both encircled by a blazing outer aura of awareness fire, and in front of Hayagriva’s lotus is a fiery skull-cup that contains swirling blood and the sense organs of a heart, a tongue, and two ears. To the right of Garuda is the ‘Glorious Goddess’ Shri Devi (Palden Lhamo) in her form as ‘Ekajati, the most awesome one’, (Tib. e-ka-dza-ti ra-tu rngams). Lhamo Ekajati is extremely wrathful and blue-black in colour with two arms, sagging breasts, three round red eyes, and a gaping mouth that reveals her bared fangs and twisting red tongue. Her tawny upward-streaming hair is adorned with a bow of red cloth and three peacock feathers, and the golden disc of the sun shines from her navel. She wears golden ornaments, a five-skull crown, the five bone ornaments, a garland of severed heads, a tiger-skin loincloth, and a long billowing red silk scarf. With her right hand she wields aloft a vajra-handled curved knife, and with her left hand she holds a skull-cup full of blood in front of her heart. Amidst a maelstrom of swirling green-black wind Ekajati sits sidesaddle upon her small brown mule, which she rides above an ocean of swirling red blood and fat. The mule’s saddle blanket is made from a flayed human or rakshasa skin, and its bridle, reins and crupper straps are fashioned from poisonous serpents. At the front pommel of her saddle is a white rakshasa skull, below which hang upon serpent-threads three of Palden Lhamo’s magical weapons: the ‘skin sack full of diseases’, the ‘bundle of red curses’, and the ‘black and white spotted dice’. Her fourth magical weapon, the ‘ball of variegated thread’, hangs from a serpent’s tail at the back of her mule. To the right of Ekajati in the bottom right corner is ‘Zhanglon Dorje Dudul, the protector of the transmitted precepts, subduer of demons’ (Tib. bka’-srung zhang-blon bdud-rngams ‘dul). Zhanglon is the special protector of the Tibetan Medical Tradition, and he is wrathful and blue-black in colour, with three round red eyes, upward blazing red facial hair, and a gaping mouth that reveals his sharp fangs and twisting red tongue. He sits in a posture of royal-ease upon two human corpses that lie upon the golden sun-disc of his pink lotus pedestal, and his radiant red aura is surrounded by a blazing mass of awareness fire. His tawny mass of curly hair is piled up above his golden crown, and he wears gold ornaments, felt boots, a silk belt, and several multicoloured silk robes, the outermost two of which are green-black in colour and embroidered with golden designs. With his right hand Zhanglon holds a blazing eight-faceted gem in front of his heart, while with his left hand he holds a jewel-topped golden treasure vase at the level of his hip. Zhanglon’s lotus seat rests upon a triangular vajra-rock formation, in front of which are jewel offerings and several auspicious emblems of the chakravartin or ‘universal monarch’. In the bottom left corner is ‘Dorje Trabring, the subduer of demons that cause diseases’ (Tib. rdo-rje khrab-ring nad-gdon ‘joms), one of the eight special medical protectors that appear in the retinue of Zhanglon. Dorje Trabring is similar in appearance to Krodha Vajrapani, and his powerful form is surrounded by a blazing mass of awareness fire. He is extremely wrathful and blue-black in colour, with three round red eyes, upward blazing red facial hair, and a gaping mouth that reveals his sharp fangs and twisting red tongue. In standing pratyalidha posture he leans towards the right upon the golden sun-disc of his pink lotus throne, which is supported by a grey-black boar and a nine-headed blue-black boar. Dorje Trabring wears gold ornaments, a five-skull crown, the six bone ornaments, a tiger-skin loincloth, a human-skin shawl, and a garland of freshly severed heads. A freshly flayed elephant-skin covers his back, a serpent serves as his sacred thread, and two serpents dart out from either side of his body. With his right hand he wields aloft a golden five-pointed vajra, while with his left hand he makes the threatening raised-finger or tarjani gesture in front of his heart. His tawny-red hair streams upwards with an entwined serpent in its midst, a bird of prey descends at the left side of his head, while a snake-devouring red garuda flies out from behind the left side of his hair. The swooping form of a fierce serpent-devouring, blue-black garuda appears above Dorje Trabring’s head, holding two shield-like wheels or chakras in his hands, both of which have swirling trefoil ‘wheels of joy’ at their centres. The wheel in garuda’s right hand is a weapon-wheel with eight sharp triangular blades, while his left hand wheel is a lotus-wheel with eight colourful petals. The adjacent forms of Dorje Trabring - who appears like Vajrapani, along with Hayagriva and Garuda create a special trinity of protector deities, which guard against the poisonous afflictions of earth spirits, naga-serpents and naga-related illnesses, and purifies all the defilements of body, speech and mind. 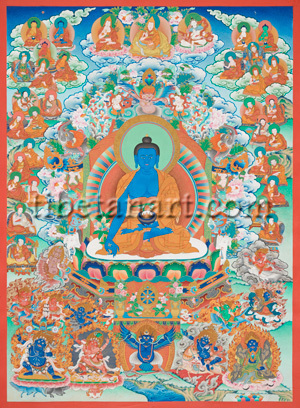 The five protectors described above appear in a row across the bottom of this thangka, with the remaining seven special medical protectors of Zhanglon Dorje Dudul's retinue appearing above. The great planetary and eclipse deity, ‘Rahula, the glorious liberator who steals life’ (Tib. srog-‘phrog ra-hu dpal-la ‘gying), appears amidst storm clouds to the left of the Medicine Buddha’s lotus seat. Rahula is extremely wrathful and brown in colour, with nine fierce heads, tawny upward-streaming hair, two arms, the upper body of a demon, and the lower body of a serpent. His nine brown heads are stacked in three tiers, with each head having three round red eyes, a gaping mouth with sharp fangs, and a crown of five dry white skulls. Crowning his upper three heads is the head of a black raven, whose shadow causes a fit of apoplexy upon whomever it falls. Rahula wears gold ornaments, a human-skin shawl, a tiger-skin loincloth, and his powerful upper body is adorned with a ‘hundred-thousand eyes’, and a fierce face with a huge voracious mouth appears on his stomach. With his raised right hand he wields a serpent-noose, and with his left hand he holds a bow and arrow (not shown). The coils of his serpentine lower body rest upon his vehicle or mount – a fierce nine-headed pink makara or ‘water-monster’. Below Rahula is the wrathful demonic form of the female protector ‘Jigje, red in colour, the foremost of rakshasa’ (Tib. srin-po’i gtso-bo ‘jigs-byed dmar). Jigje is fierce and red in colour, with two arms, one face, three round red eyes, a gaping mouth, sharp fangs, and tawny upward-streaming hair. She wears gold and bone ornaments, a gold crown, a human-skin shawl, and a tiger-skin loincloth. With her right hand she wields aloft an iron sword, and with her left hand she holds an iron trident that is adorned with a yak-tail and a blue silk ribbon. She abides amidst a blazing mass of wisdom fire as she rides upon her vehicle or mount – a nine-headed resurrected corpse or zombie. To the left of Jigje is the wrathful female protector ‘Shenpa Marpo, the tiger-faced liberator’ (Tib. stag-gdong shan-pa dmar-po ‘gying). Shenpa Marpo is red in colour, with two arms, tawny upward-streaming hair, and the fierce red face of a tiger with two round red eyes and sharp teeth. Her vehicle is a turquoise ‘water-dragon’ with a ferocious face, sharp fangs and horns, an upturned snout, and a tawny mane. She wears gold and bone ornaments, a tiger-skin loincloth, and abides amidst a blazing mass of awareness fire. With her right hand she wields aloft a red copper sword with a vajra-handle, and with her left hand she lifts a skull-cup full of blood to her mouth. To the right of Jigje is the wrathful male protector ‘Hab-se, dark-blue in colour, master of the lives of living creatures’ (Tib. skyes-dgu’isrog-bdag hab-se mthing). Hab-se is dark-blue in colour, with four arms, and a fierce face with three round red eyes, upward blazing facial hair, a gaping mouth, and sharp fangs. His tawny hair streams upward above his golden crown, with the head of a black raven appearing amidst his matted locks. He wears gold and bone ornaments, a tiger-skin loincloth, and he abides amidst a blazing mass of wisdom fire as he rides upon his vehicle or mount – a nine-headed grey bear. With his first right hand Hab-se holds the shaft of a long spear-flag, and with his second right hand he wields aloft an iron dagger or phurba with a vajra-handle. With his first left hand he holds a blue skin-sack that is filled with diseases, and with his second left hand he holds the severed head of an enemy. Appearing amidst dark storm clouds to the right of the Medicine Buddha’s lotus throne is the wrathful wolf-faced female protector ‘Chejangma, red in colour, mistress of Dakinis’ (mkha’-‘gro gtso-mo lce-spyang dmar). Chejangma is red in colour, with four arms, and the ferocious red face of a wild she-wolf with two piercing eyes, sharp fangs, a twisting red tongue, and an upward-streaming mane of tawny-red hair. She wears golden bracelets, armlets and anklets, the five bone ornaments, a human-skin shawl, a tiger-skin loincloth, and she rides upon her vehicle or mount – a nine-headed grayish-white bird. With her first two right and left hands she holds the sharp vajra-handled curved knife of the dakinis above a skull-cup full of blood in front of her heart. With her second right hand she holds a precious bowl filled with a blazing mass of fire, and with her second left hand she holds a noose of human intestines. Below Chejangma is the wrathful male protector ‘Soki Putri, the oath-bound awesome one’ (Tib. dam-can srog-gi spu-gri rngams). Soki Putri is blue-black in colour with two arms, three round red eyes, upward-blazing facial hair, and a gaping mouth that reveals his sharp fangs and twisting red tongue. He abides amidst a mass of fiery blood-red wind and fire, while his tawny-red hair streams out behind his five-skull crown as he rides upon his vehicle – a fierce white lion with a turquoise mane. He wears golden ornaments and billowing garments of multicoloured silks, with an outer green-black robe of embroidered brocade. With his extended right hand he holds a wave-shaped iron razor with a vajra-handle, and with his extended left hand he holds the torn-out heart of an enemy. To the left of Soki Putri is the wrathful female protector ‘Shanti Rozenma, the foremost of she-demons’ (Tib. shanti ro-zan bdud-mo’i gtso). She is green in colour with two arms, sagging breasts, and the fierce green face of a kite or garuda, with a sharp iron-like beak, two sharp horns, and two yellow-red eyes. She wears gold ornaments, the five bone ornaments, a flayed human-skin shawl, and a tiger-skin loincloth. She abides amidst a blazing mass of fire as she rides upon her vehicle – a nine-head blue ‘iron’ wolf. With her right hand she holds a noose of human intestines and the shaft of a vajra-sealed iron hook, and with her left hand she holds the torn-out heart of an enemy.